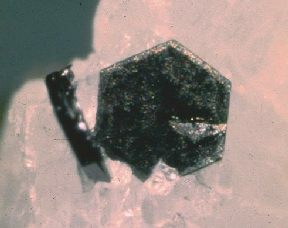 The graphite crystals from Crestmore California (below) are some of the finest in form known to this author. 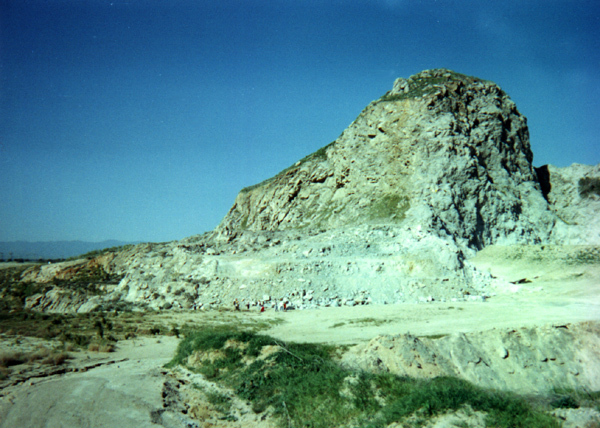 Comparable crystals also occur at several localities in New York, such as the #4 Quarry, Gouverneur Talc Company (Valentine Mine) near Harrisville, and the Treadway Quarry near Port Henry. with green diopside in calcite. Growth spiral on a 1 mm graphite crystal in calcite. Click here to compare other spirals. Page 2: Growth spirals on Crestmore graphite. JASZCZAK, J.A. (1991) Graphite from Crestmore, California. 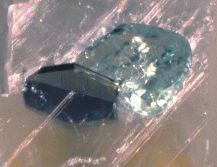 Mineralogical Record 21, 427-432. JASZCZAK, J.A. (1994) Famous graphite crystals from Sterling Hill, New Jersey. The Picking Table 35, (2), 6-11. JASZCZAK, J.A. (1995) Graphite: Flat, Fibrous and Spherical. In, Mesomolecules: From Molecules to Materials. G.D. Mendenhall, A. Greenberg, and J.F. Liebman, editors. (Chapman & Hall, New York) pp. 161-180. PALACHE, C. (1941) Contributions to the mineralogy of Sterling Hill, New Jersey: morphology of graphite, arsenopyrite, pyrite, and arsenic. Amercan Mineralogist 26, 709-717.